The gyro concept just keeps getting burger. 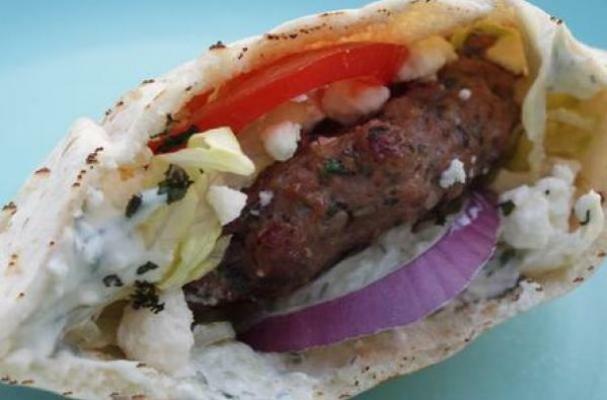 Try buying ground lamb and forming it into patties before tucking it into a fluffy pita with tomato, red onion and Greek dressing. It’s an easy dinner choice and a great gateway for picky eaters to see if they enjoy lamb. Prepare the patties like you normally would with the ground lamb, eggs, bread crumbs, salt and pepper. The feta cheese can be included in your meat mixture or added later as a topping. Sear the patties in a pan coated with olive oil for moisture and flavor. The pita bread rounds can be served flat with the patty on top, or you can fold the bread over the burger. Top your creation with Romaine lettuce, tomato slices, red onions and feta cheese crumbles. A creamy Greek dressing compliments the flavors nicely. For a tasty garnish, place a toothpick with a black olive into the completed burger. This addition will also help hold the sandwiches in place, if you folded the pita bread over the meat.